vSphere 6.0 RC – Still Under NDA? vSphere 6.0 RC was announced a few hours ago. As a beta tester of vSphere 6.0 am I still under NDA? Rhetorical question, answer: Yes. UPDATE: A few minutes after I posted this, VMware removed the post, but you can see it here. There is also an article at The Register. By the way, “RC” stands for “Release Candidate”. 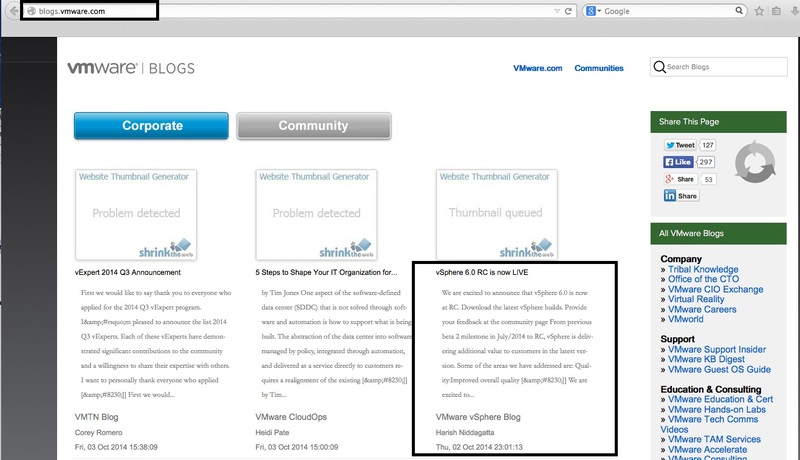 During VMworld there were a lot of public references to the features of vSphere 6.0 in the keynote & breakout sessions. Fast forward to the “RC” release today and VMware are providing additional feature information as part of the announcement. As a blogger, I feel like I have been muzzled by the NDA, whilst VMware are disregarding their own rules. I was hoping the GA version would be released during VMworld and I prepared a number of blog posts that are still in the “Draft” state. If they were serious about the NDA (on a public beta), they would save all announcements until the official GA release and give all the beta participants an equal opportunity to talk about it. VMware: Drop the NDA requirement on all Public Betas. It feels like you are taking advantage of the vCommunity by abusing our time and enthusiasm and only allowing yourselves to talk about the “worst kept secret”. If the NDA is so important, then restrict beta participation to trusted customers/vExperts (as with previous vSphere releases) and do not blabber about in public it until the GA release. You cannot have it both ways, make up your mind. Absolutely, VMware has handled this terribly! I published some blog posts about the contents of the vSphere Beta during VMworld. I was under NDA but only published information that VMware shared publicly in their keynotes and sessions. So, perhaps I technically broke the NDA but only after VMware spilled their own beans. I had some feedback from VMware and it seems that the product teams were not entirely aware of all the information the sessions were releasing. They said my post content was all fine but asked me to stress this was still a Beta and Tech Preview rather than finished product which I added to the post as it was a valid point. You can’t run a NDA beta with 10,000 people and also announce the name as well as major functionality at your worldwide conference. Either keep it private and under NDA or a public Beta everyone can talk about. Can you imaging Windows 10 being available to everyone and also under NDA? Hopefully next time, VMware will be able to navigate this a little better. I agree…they have moved to a public beta model…NDA should not be in effect. After all those of interested in the next release and the champions of the changes coming!